Ребяты! Это однозначно 1 место на СС 2015! Ваабще нет вопросов. Даже гадость написать не могу. Все на отлично. Эффекты, музыка и особенно графика! 1 место, не слушайте никого, потому что Вас засудили однозначно! Во всем виноват только Унбеливер! Why so compactly? Very well coded and composed, but too short! Give us more! Для первого раз думаю, что вполне не плохо. Было сделано максимально все, что планировалось. Да, какие-то детали надо дошлифовать, довести до идеала, но это удачный шаг в новую среду. was it zapilyator or 3D engine? The nice thing about this prod is that it almost came from nowhere. There were rumours about a big demo in progress, but there are many rumours so it is always hard to know the truth. 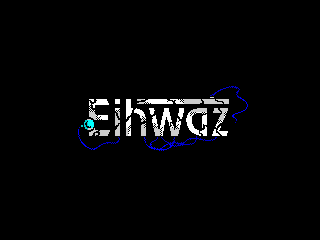 Eihwaz, for me, it one of the first ZX Spectrum demos with a proper 3D engine to use the engine artistically, not as a technical demonstration. I loved how it was used along with striking pixel art. However, for me personally, the scenes that worked best were the scenes where 2D silhouettes were animated. The image of flying man raising up the debris was extremely haunting and has a true staying power. The third place was a little unexpected and possibly unfair even, but I suspect that this is mostly Kpacku's fault - coming after that was not fair. And how well Eihwaz held up to that challenge is a testament to just how good this demo truly is. Good solid demo with a nice glitchy mix of 3D/2D effects. impressive 3d engine and cool flow with clever design. rocked at party! Really enjoyed this one, good music, nice graphics, interesting design. Cool! Very powerful demo with strong code without sacrificing visual presentation. Proper stuff. Well done and good luck with next work! surprising 3d, a-grav scenes, rounded colour button/wall as fx decoration! like it! thanks for good demo! oho..best soundtrack i have heard on spectrum..
it took me so long to write a comment on this demo, because i completely had to comprehend the whole demo itself, what i actually have been doing since yesterday. it's quite a hard to describe the feelings that i have experienced after watching this demo. and now i see, that eihwaz turned out very symbolic. when everything around looked like it may collapse in every second, and almost collapsed - suddenly, something unexpectable was happened, and all the world came back from the utter debris. and opened its eyes. i don't know, if you say everything you wanted, or not, and, frankly speaking, i don't want to know. you said enough. and i think, i will rewatch it again and again. and i'm not even talking here about almost revolutionary 3d-engine (which, i guess, will only improve and evolve). i just could not give it a cdc. so here it is. thank you for the demo. and all we are awaiting for the next. Beautiful design, jaw-dropping 3d, deserves a separated review. Cool 3d and some artistic scenery! Extremely good! Chock full of great ideas and effects. Never thought I can say anythink like this, but now I completely agree with Photon. page created in 0.017975 seconds with 15 queries.